Guayaquil along the Pacific coast is the country's chief port and largest city, while Quito, the capital, is the second most populous. Guayaquil, the capital of Guayas Province, is the largest and most populous city in Ecuador. Ecuador is a South American country whose capital city is Quito. The country derives its name from the equator which passes through the country. Ecuador is divided into 24 administrative provinces within which some of Ecuador’s biggest cities are located. Most of the population of Ecuador is concentrated in the urban towns and cities where they access employment opportunities from the industries and businesses running in these cities. Since the country was colonized by the Spanish, most of her towns and cities were established during this period and continue to serve most of their original functions. Guayaquil, the capital of Guayas Province, is the largest and most populous city in Ecuador with a population of about 2,278,691. 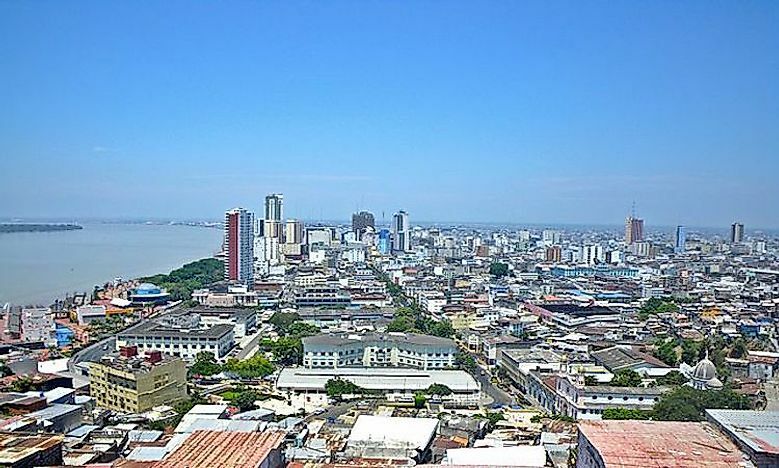 Guayaquil was founded in 1538 as a native village before falling under Spanish rule on gaining her independence in 1820. The city is a major commercial town in Ecuador with most of the import and export trade being conducted through the Gulf of Guayaquil. A large population of the city engages in trade and other informal activities such as agriculture, aquaculture, and other business. The city serves other functions such as transport, education, sports, tourism and entertainment. Quito is the second largest and populous city with a population of about 1,607,734 and capital of Pichincha Province. Quito was declared a city in 1541. The city served as an administrative town of Spain. Today the city is recognized as an important historical center. Quito is divided into three regions that are separated by hills. The northern part is a modern region with modern buildings, shopping centers, financial institutions, and working-class residences, the central region houses the old colonial city and the southern region has industrial and residential units. Cuenca, in the highlands of Ecuador, is the third largest and populous city in Ecuador with a population of 329,928 and the capital of Azuay Province. Archaeological evidence show settlement in the present day city existed around 8060BC with the population primarily engaging in cultivation and made ceramics. Cuenca was colonized by the Spanish who founded it in 1557. Cuenca is an important historical center due to its unique 17th and 18th-century Spanish architecture as well as archaeological materials collected from the dwellings of the earlier inhabitants. The city serves as educational, administrative, transport, and cultural functions. The city’s surroundings include the rural area of Molleturo, the Andes ranges, and El Cajas national park with rivers, streams, and lagoons. Santo Domingo was founded in 1861 and serves as a commercial and industrial center as well as the capital of Santo Domingo de Los Tsachilas. The city is the fourth most populous with about 270,875 people. Santo Domingo is located in the foothills of west Andean ranges and connects lowland cities such as Quevedo, Chone, and Quininde to the Pacific coast. Santo Domingo is plagued with pollution and destruction of forests which has affected the traditional way of life of the local people. The city is also prone to flooding during the rainy season leading to the destruction of roads. The major problems associated with the cities in Ecuador include increased crime rate especially along transport routes and in the water transport terminals, pollution from industries, deforestation to expand land for cultivation, Ozone layer depletion due to global gas emissions, desertification, and soil erosion. Other big cities in Ecuador include Machala, Duran, Manta, Portoviejo, Loja, and Ambato.